And the captivity of this host of the children of Yisra’el shall possess that of the Kena’aniiym, even unto Tsarephath; and the captivity of Yerushalayim, which is in Cepharad, shall possess the cities of the Negev. 21 And saviours shall come up on mount Tsiyon to judge the mount of Esau; and the kingdom shall be the YAHUAH’S. Now, in the modern Hebrew these two words (Tsarephath and Cepharad) have particular meaning: Tsarephath means France, and Cepharad means Spain. The contemplation of this passage is twofold. Those of the house of Yisra’el in France will come to possess the land of the Kena’aniym, and the captivity of Yerushalayim, which is in Cepharad, will come to possess the land of the Negev (or south). Following the fatal head wound inflicted on the Ottoman Empire following WWI, the French did in fact come to control the northern portion of the Levant, now known as Lebanon and Syria. They still exercise some authority over the region (let’s call it persuasive authority over whatever is left of Christian Lebanon). The question before us concerns the captivity of Yerushalayim which is in Cepherad, or Spain. Spain holds such a unique place in history, given its founding and development. Spain’s largest river is called the Ebro. Let’s consider the source of this name, which is, as you might imagine, a Hebrew word. The word here is Ibriy (עִבְרִיִ), which is translated as Hebrew; that is, an Eberite or descendant of Eber. Now, the name Eber is of course a guess at its pronunciation. Take a look: עבר (ayin-beit-resh). While, of course, the word could be pronounced Eber (ay'-ber), placing no vowel sound on the resh), consider if we did place a vowel sound such as oh or ah on the resh. Suddenly Eber becomes Ebero, or Ebera. Suppose we removed the vowel sound for the beit, and left only the vowel sound for the resh, hence: Ebro or Ebra. (Here, we see the ancient name of the river in Spain). Now, consider that we grace this name with the heavenly YAH, and we construe the ayin as having an “I” sound, rather than an “E” sound: Hence Ibero, or Ibera, and when joined with YAH as a prefix, which reach Iberyah, or Iberia. You recall that Spain is known as the Iberian Peninsula. Now, you know the source. Now, let us consider the other twin son of Yahudah: Zerach (Zara). As mentioned in previous blogs, the symbol of the house of Yahudah is the lion. 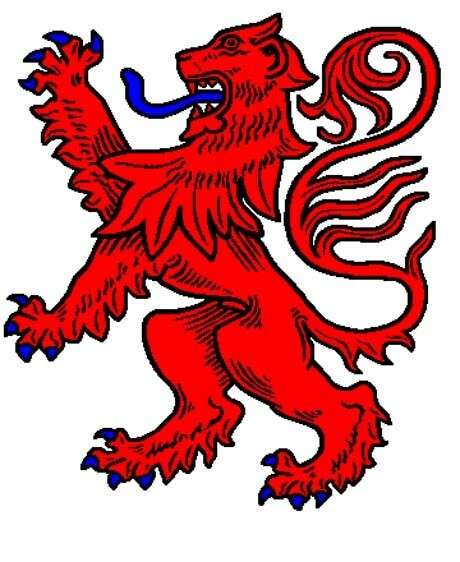 But there are two of them – the Golden Lion, for the house of Peretz (Pheres), and the Red Lion, for the house of Zerach (Zara). And it came to pass in the time of her travail, that, behold, twins were in her womb. 28 And it came to pass, when she travailed, that the one put out his hand: and the midwife took and bound upon his hand a scarlet thread, saying, This came out first. 29 And it came to pass, as he drew back his hand, that, behold, his brother came out: and she said, How have you broken forth? this breach be upon you: therefore his name was called Peretz. 30 And afterward came out his brother, that had the scarlet thread upon his hand: and his name was called Zerach. Yahudah is described as a “lion’s whelp” in the blessing of Yisra’el set forth in Bere’shiyth (Genesis) 49, hence the symbol of the lion for both houses – the house of Zerach and the house of Peretz. The standing lion is called the rampant lion, an aggressive posture to be sure. However, the lineage of Zerach is unspoken. Whereas Peretz is traced generation by generation to the time of HaMashiach, we are not told of the history of Zerach until we reach the writings of Ezra. It is entirely possible that this line is not traced because the house of Zerach left Egypt before the exodus of the house of Yisra’el. It is also possible that the house of Zerach is the captivity of Yerushalayim, having departed westward following the destruction of Shalomah’s Temple in 586 BC. So Yahusha rose up early in the morning, and brought את-Yisra’el by their tribes; and the tribe of Yahudah was taken: 17 And he brought the family of Yahudah; and he took the family of the Zarchiym: and he brought את the family of the Zarchiym man by man; and Zavdiy was taken: 18 And he brought his household man by man; and Akan, the son of Karmiy, the son of Zavdiy, the son of Zerach, of the tribe of Yahudah, was taken. 19 And Yahusha said unto Akan, My son, give, I pray you, glory to YAHUAH ELOHIYM of Yisra’el, and make confession unto him; and tell me now what you have done; hide it not from me. 20 And Akan answered את-Yahusha, and said, Indeed I have sinned against YAHUAH ELOHIYM of Yisra’el, and thus and thus have I done: 21 When I saw among the spoils a goodly Babylonish garment, and two hundred sheqels of silver, and a wedge of gold of fifty sheqels weight, then I coveted them, and took them; and, behold, they are hid in the earth in the midst of my tent, and the silver under it. 22 So Yahusha sent messengers, and they ran unto the tent; and, behold, it was hid in his tent, and the silver under it. 23 And they took them out of the midst of the tent, and brought them unto Yahusha, and unto all the children of Yisra’el, and laid them out before YAHUAH. 24 And Yahusha, and all Yisra’el with him, took Akan the son of Zerach, and the silver, and the garment, and the wedge of gold, and his sons, and his daughters, and his oxen, and his asses, and his sheep, and his tent, and all that he had: and they brought them unto the valley of Akor. 25 And Yahusha said, Why have you troubled us? YAHUAH shall trouble you this day. And all Yisra’el stoned him with stones, and burned them with fire, after they had stoned them with stones. 26 And they raised over him a great heap of stones unto this day. So YAHUAH turned from the fierceness of his anger. Wherefore the name of that place was called, Emeq Akor, unto this day. Now in the writings of Ezra, referred to in the English as 1 and 2 Chronicles, the lineage is finally set forth to some degree. And Tamar his daughter in law bore him Perets and Zerach. All the sons of Yahudah were five. 5 The sons of Perets; Chetsron, and Chamul. 6 And the sons of Zerach; Zimriy (Zavdiy), and Eythan, and Heyman, and Kalkol (Calcol), and Dara: five of them in all. 7 And the sons of Karmiy (son of Zavdiy); Akar, the troubler of Yisra’el, who transgressed in the thing accursed. 8 And the sons of Eythan; Azaryahu.